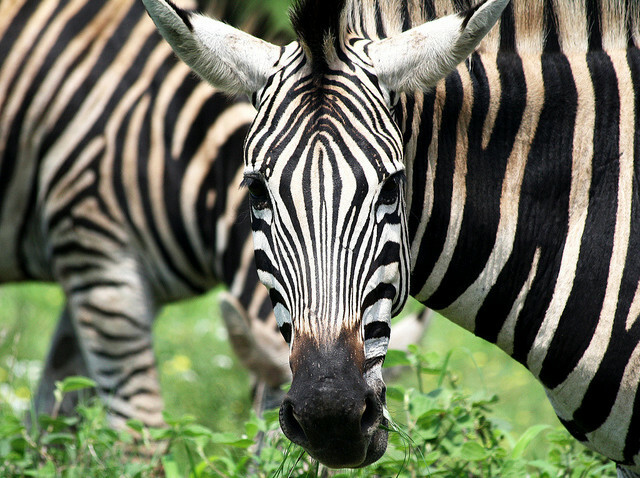 When was the last time you saw a live zebra? Just thought I’d throw that out there. I’m not actually sure when the last time for me was, but alas it was not in the wild. They are rather impressive-looking, though – and humans sure love impressive animals. As I determined yesterday, at some point in their evolutionary history zebras went from black to striped. Of course, scientists have been trying to figure out for centuries: what’s the use for these stripes? Every couple years a news article crops up claiming to have the definitive answer to the question. One year it’s camouflage, then it turns out to have something to do with blood-sucking flies, and the next thing you know it’s actually about thermoregulation. This quest for the answer to the “stripe question” is an excellent illustration of how complex the process of science can get when you can’t do a simple double-blind trial to examine your hypothesis. It may just take a long time to get to a scientific consensus; in the case of zebra stripes, we still don’t have one.1 Even so, the self-correcting nature of the scientific process is actually one of its strengths. So, what do we have so far on zebra stripes? There are a few leading hypotheses. Zebras are social animals, they graze, move, and generally hang out in groups. If you have a bunch of them running fast across a plain, the potential predator may just get highly confused about who is who, and miss out on the target altogether. Fittingly, the collective noun for a bunch of zebras? A dazzle. A dazzle of zebras. Yeah. This one is rather fascinating. The hypothesis goes that because white stripes and black stripes heat up in the sun at a different rate, air moves at a different speed across them. As a result, you get little convection currents surrounding the body of the zebra, cooling it down. A recent study published in Royal Society Open Science found that plains zebras living in warmer environments sport more stripes. They did not, however, explain why. As I mentioned above, this is one of the hypotheses that gets paraded in science news time after time. One study from last year in Nature Communications showed a correlation between regions where biting flies are more of an annoyance, and the stripedness of zebras in these regions. The more flies, the more stripes, so it seems. In 2012, biologists in Hungary tested striped patterns for fly attractiveness and found the bugs don’t really like landing on striped surfaces. So there is some evidence to support this theory, just like the others.